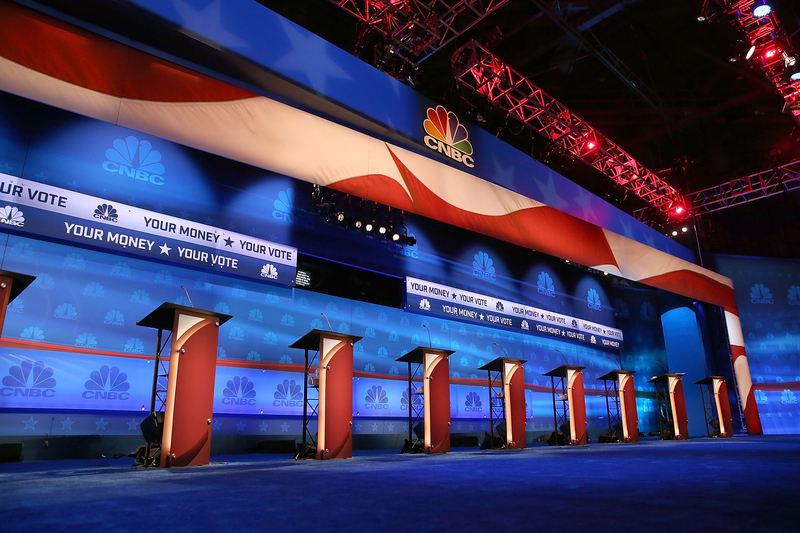 The next Republican debate is rapidly approaching, but the stage is going to look a bit different this time. The primetime debate will have one fewer candidate than before, as Chris Christie’s anemic polling has resulted in him getting booted down to the undercard debate. Meanwhile, Jeb Bush’s plummeting support means that his podium will be scooted away from the middle and closer to the edge of the stage, right next to John Kasich. Jeb! is probably unhappy about this, and may be wondering: Does podium placement matter at debates? No. Sure, everyone candidate would love to be standing in the middle on the debate stage. This makes them, quite literally, the center of attention, and serves as a visual reminder of their dominance in the polls. But ultimately, debates exist so that candidates can outline their policy positions and challenge their opponents’. On an even more basic level, debates are simply an opportunity for candidates to talk in front of millions of viewers. As we saw at the last debate, the arrangement of podiums has no bearing on the candidates’ opportunity to speak. At CNBC’s widely-criticized Republican debate, Donald Trump and Ben Carson were in the middle of the stage. But when the debate was over and the candidates’ speaking time was tallied, neither Trump nor Carson came out on top, or even in the top three. Carson spent less time talking than everyone on stage other than Rand Paul and Jeb Bush, the latter of whom was placed closer to the center of the stage than Carson. Meanwhile, Trump ranked fourth in speaking time; this put him behind Kasich, whose terrible polling landed him the podium farthest from the center. Other debates have shown similar disparities between podium placement and speaking time. At CNN’s Republican debate, Scott Walker was given decent placement on the stage: Two podiums away from the middle. And yet he spent less time talking than of the other 10 candidates on the stage. (Not coincidentally, his candidacy floundered and he dropped out of the race soon after that debate). Carly Fiorina, meanwhile, was further away from the middle than Walker, but she came in third in speaking time, behind only Trump and Carson, the two center-stagers. At the end of the day, debates are free-for-alls. They are ostensibly governed by rules, but in reality, candidates scratch and claw at each other (and the moderators) for every minute of speaking time they can get. Ambitious debaters like Fiorina and Kasich understand this, and haven’t let sub-par stage placement stifle them. Carson and Walker, meanwhile, have shown that preferential podium placement is no guarantee of success on the debate stage.